Love the feeling when the cool breeze passes through your voluminous hair? Everyone desires to have such hair forever and ever! Although at times, be it due to the ageing process or due to numerous other causes including a low iron levels, known or unknown bleeding, previous history of fever/ other illness, hair care procedures, crash diest etc. one may end up with noticeable hair fall. In a genetic hair fall the hair loss may be slow although in the aforementioned causes the hair fall is progressive and voluminous. This makes the patient feel under confident and depresses. Fret not, coz with every problem comes a solution. However, when it comes to your skin, hair or body one should be very careful while making choices, as risks are unaffordable. If you have been searching for the best Hair Fall Treatment Doctor in Delhi, your search ends here! At Dr. Kandhari’s Skin Clinic we provide you with various options to restore the lost hair as well as prevent further hair loss. Let us have a look at the Advanced Hair Fall Treatments that can help you get your healthy hair back. 1. PRP (Platelet Rich Plasma) Treatment – PRP has gained immense popularity in clinical & aesthetic practice. Platelet Rich Plasma has all the essential factors that help in nourishing the hair and ultimately promote hair growth. This is helpful in Patterned Hair Fall and Diffuse Hair Fall. a. Safe Procedure – PRP treatment is done with your own body cells and is hence safe. b. Comfortable – No surgery involved. c. Convenient – Enjoy minimum downtime or recovery time. 2. Dermaroller Treatment – If you are facing patterned baldness, dermaroller Treatment is another option to consider. The technique involves using an effective micro-needling technique to enhance absorption and promote regeneration of the hair follicles. It improves scalp health by stimulating blood flow. The dermaroller technique may frequently be combined with stem cells (GROfactor) to enhance outcomes and give you more density in lesser time. Visit Dr. Kandhari’s Clinic to get an affordable yet very effective dermaroller treatment. 3. Hair Transplant – Hair transplant is a surgical technique. Here, hair follicles are removed from one part of the body (Donor Site, usually back of the scalp) to the bald section (Recipient Site). a. Good looks – Fills the balding patches and enhances looks. b. Fewer visits to the doctor – Typically the hair transplant process is a “one time” affair. Although this is dependent upon the age, grade of baldness and the success of the procedure. c. Affordable – As the results are long lasting it is one of the cost-effective solutions for baldness. d. Normal Care – Transplanted hair works like regular hair. It involves normal hair care. It is said, “Invest wisely in your hair, it is a crown you never take off. It is permanent.” Well, investing a little for your hair is worth it as it’s your best accessory. Isn’t it? Still got some questions about the hair loss treatments? 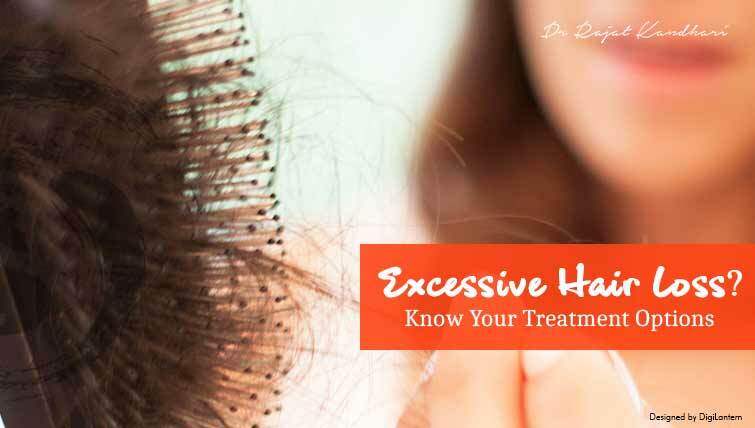 Relax and consult Dr. Rajat Kandhari for effective Hair Loss Treatment in Delhi. Book an appointment today, log on to www.drrajatkandhari.com.